The Guitar Column: Tyler Psychedelic Vomit #5 On eBay! Here's a rare axe sure to make any Tyler guitar fan reach subconsciously for his pocketbook. As the seller points out, the early Psychedelic Vomit's had a 'cloud-like' vibe to the color swirls in the finish. And this one looks very similar, finish-wise, to Psychedelic Vomit #1 which I had the chance to check out when I visited Jim Tyler's shop in 2000. The more recent PV's have swirl patterns with more defined edges. As per Landau's specs at the time, this guitar features a Mamywo body (Tyler-speak for Malaysian Mystery Wood), maple neck with maple fingerboard and a 'block-saddle' Wilkinson VS100 tremelo bridge. The electronics are pretty straightforward -- two Seymour Duncan Classic Stack pickups in the front and middle positions and a Seymour Duncan Hot Rails at the bridge with a standard 5-way selector switch. On later editions, Jim Tyler went with custom-wound Seymour Duncan Little '59 stacked single-coil-sized humbuckers in the bridge position. We'll probably not see another one of these early Tyler guitars for a very long time! What a find! I gotta run this one. Go for it! 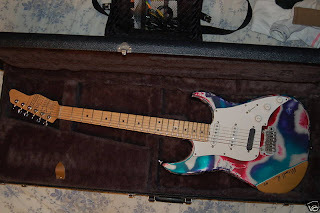 I can't believe the seller is letting this one go..
Yeah, he wants to order a trans blue maple top. The listing description is kinda weird. He's not very sales oriented.